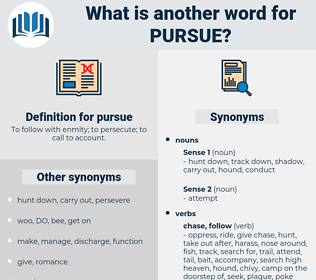 What is another word for pursue? To follow with enmity; to persecute; to call to account. Prosecuted, Resumed, considered, concluded, lay, needed. 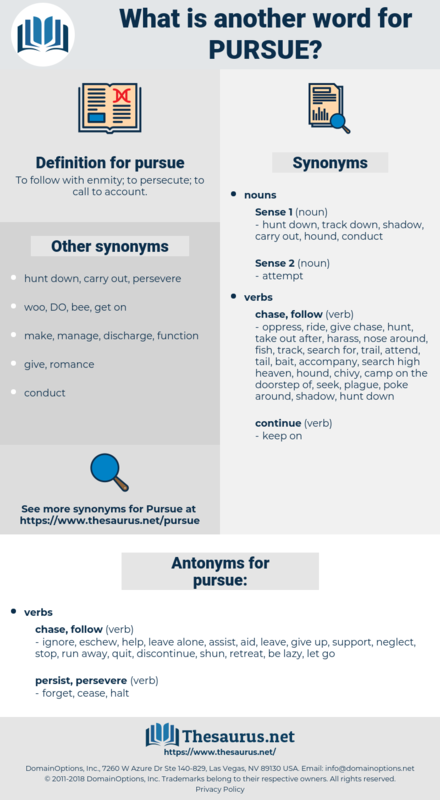 parts, lay, Parties, exercise, practise, accomplish, endeavour, observe, defend, embark, persist, deepen, vindicate, exploit, Considering, fulfill, used, encourage, impose, put, operationalize, represent, attend, steer, discuss, tackle, realise, ccontinue, enlist, spur, choose, trace, treat, hire, perpetuate, enjoy, embrace, negotiate, solicit, produce. sue, persecute, persevere, assert, adhere, deploy, serve, explore. ignore, eschew, help, leave alone, assist, aid, leave, give up, support, neglect, stop, run away, quit, discontinue, shun, retreat, be lazy, let go. lead, pilot, lose, guide, hide, head. Mike managed, as I had done, to get out of Bruin's way; and before the creature could turn to pursue either of us, over it fell, on the very ground on which we had been sleeping. And pursue the boats, sir? tail, trail, dog, give chase, stalk, chase, chase after, haunt, go after, tag, track.